Messi, Suárez and Neymar Jr are in great form. The three strikers have been the protagonists in FC Barcelona’s latest run of victories as they have contributed 23 goals out of the 33 scored. In fact, the blaugranas have won eight of their last nine games and one of those wins was the epic 6-1 comeback against PSG which secured Barça’s place in the quarter finals of the Champions league. The trident contributed four goals to that historical night with Neymar Jr scoring two and Suárez and Messi grabbing a goal each. MSN have scored 90 goals this season in all competitions. Messi leads the way with 43, making him the top scorer in both LaLiga and the Champions League. Suárez is second with 32 strikes and he has opened the scoring in the Catalans’ last five games. Neymar Jr isn’t far behind having recently scored his fifteenth of the season and 100th in a Barça shirt. Their goalscoring record is spectacular and reflects the trio’s incredible ability. They lead the way in Europe and are only ten goals away from scoring a century of goals for the third time. Their prowess is one of the main reasons Barça are still in with a chance of securing another treble. The second most prolific trident in Europe is PSG’s combination of Cavani, Lucas Moura and Di María with 65 goals; then Real Madrid with 59 goals; followed by Bayern Munich and Napoli in fourth and fifth place. As well as their insatiable appetite for goals, the three Barça stars have provided plenty of assists. 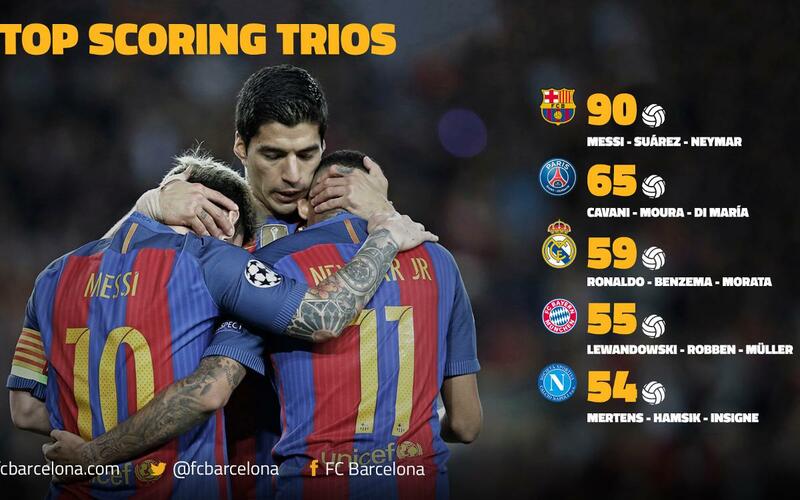 In total, the trio have given the final pass 46 times. Neymar leads the way with 19, Suárez has 14 and Messi has 13. Napoli, with 28, are the closest to the blaugranas in this category and they have just over half the amount proving that Barça have the most effective trident in the footballing world.